Ann Hoang lives with her husband, Thao, and two of their three children in the Pacific Northwest. She wrote Callisto in the late 1990’s as a way of coping with the sudden onset of a psychiatric disorder. The poetry reflects her attempt to deal with intense feelings and memories. Today Ann is an avid gardener and quilter as well as a stay at home mom. Callisto: A Collection of Poetry by Ann Hoang is a journey by the author through a time in her life that was troubling for her and, as such, is a truly personal account. The poems are designed to chart her journey with a flowing rhythm and allow the reader to follow her experiences. Ann uses nature to embellish her words and creates a magical link to the elements that take the reader to another plane. Her deepest feelings are laid bare for all to see. She speaks of a phantom that takes hold of her and how the only way back from the depths of her sorrow is with complete honesty and truth. Realizing this, she speaks of the need to trust and guardian angels who can aid her recovery if only she can find them. This is a short collection of beautifully written prose that is wrenched from the soul of the writer. 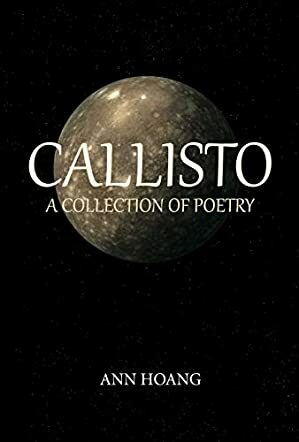 Ann Hoang has written Callisto: A Collection of Poetry to help herself and her readers to understand the issues she has faced. I loved Star Sunglasses in particular and thought it was a testament to how we can be blinded to the needs of others. The subject matter is dark yet there is a sense of joy running through this collection and I finished it filled with hope. There is a message to everyone who is not in a good place themselves, and the message is that there is hope and, with help, you too can reach the other side of the darkness.